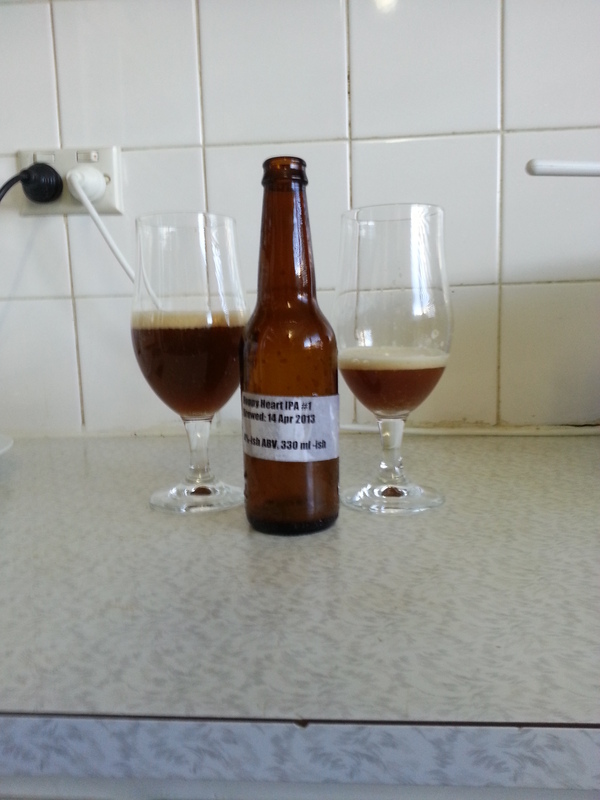 So we finally got to taste the Hoppy Heart IPA from Brewsmith that we brewed a few weeks ago. You can check out the post on the brew here. The only problem with brewing is that it requires patience, which is something I don’t have. You make your brew, wait while it sits in the fermenter, bottle it, then wait again! Why not just go to the bottle shop and get something that’s already been made for you? Well, that’s a whole lot less fun and you wouldn’t have the satisfaction of knowing it was something you’ve made yourself. Also, home brew is tasty, and this IPA was no exception. So the first exciting part of the weekend was getting some extra readers. The second exciting part was trying the IPA while making some beer. Well first of all, the colour was great: fairly dark with lots of body and head. Mikey was doing a bit of a “yay we get to taste the IPA dance” prior to opening the first bottle, which made it get shaken up, so after dealing with that mess, we got to try the beer. Getting ahead a little, but talking about the body of the beer, it seemed to have a bit of a creamy or oiliness about it. It was a pleasant feeling, and I can only imagine that it may have come from the oils that come from the hops, but that is only a guess. All in all, it added to the body of the beer. In regards to smell, it was exactly like an IPA should smell like, fruity, hoppy, just generally nice. When drinking, I really got all the different levels of hops: aroma hops, taste hops, and bitterness hops. The flavours were distinct, but together at the same time. It was quite nice. IPAs are most famous for their hoppy/bitter flavour, and this was no exception. That being said, I’ve had some very bitter IPAs. While I love lots of hops, this can be a little overpowering at times, and I can often only have one or two of these before I move on. This was not one of those, rather, it was a bit more balanced and much easier to drink. Adding to this was the fruitiness, which counteracted the bittering hops very well. Sometimes one wins out, the fruit or the bitter, but this IPA had both at neither extreme. As I finished the beer, I really began to notice the bitterness staying in my mouth, which is a lovely side effect of an IPA. So the taste really stayed, which is great. All in all, we were quite pleased with how this came out. As with the Brewsmith porter we made a while ago, this beer was very easy drinking. And finally, since the last review requested that I recommend food… My first instinct would be to just enjoy this beer on its own. It was very refreshing and good just for its own sake. The bitterness in an IPA can push out other flavours, so it may not go well with something that’s less than bold. So if you must drink it with food, drink it with something that will hit you just as hard. Keep in mind that the beer also has fruit flavours as well. A dry curry would go well, or perhaps something Mexican is what I’d go for. We were very hoppy with how the beer came out. Hop on the bandwagon, drink some IPA. I got hopped up on some tasty home brew.